14th Oct, 1965, India lost a great Tabla Wizard with the untimely death of Pandit Chatur Lal at the young age of 40. The violinist virtuoso, Late Lord Yehudi Menuhin, once remarked "Pandit Chatur Lal was one of those few supreme pioneer musicians who won for India the great and growing following it now commands in the West. He stole the hearts of his audiences wherever he went with his art and his enchanting personality". 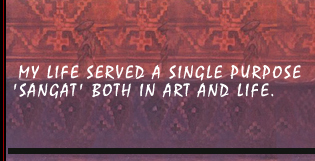 Pandit Chatur Lal himself observed, "All My Efforts Served A Single Purpose: Sangat Both In Art And Life." Pandit Chatur Lal was the first Indian percussionist to take Indian drums Tabla to the West in 1955 with Usatd Ali Akbar Khan then in 1956-57 with Pandit Ravi Shankar and so on. He was also the first Indian musician whos tabla solo LP was released both in the East & the West. A German disciple then the Director of Max Muller Bhawan, Dr. Heimo Rau, called him 'the incarnation of the god of music' who opened to the listener a fourth dimension of experience beyond time and space. Born on April 16, 1926 in Uadipur, Rajasthan. While yet a boy, Chatur Lal started a vigorous period of long and continues practice, which is the only way to attain perfection. Night after night Chatur Lal's drum-beating became a source of nuisance for the local policeman in the night duty. One day the policeman lost his patience and knocked at the door and burst upon him: "You should be in bed at this time. You have no business to keep the locality awake." A little frightened but undaunted, the little boy went on playing the Tabla every night, except when it was the time for the policemen to pass their house. In 1947, Chatur Lal came to Delhi and joined All India Radio. Since 1948, he regularly participated in programmes and conferences all over the India and Abroad. He played with masters like to name few Baba Allaudin Khan, Pandit Onkarnath Thankur, Pt. Ravi Shakar, Pandit, Ustad Ali Akbar Khan, Ustad Vilayat Khan, Pt. Nikhil Banerjee and many others. In 1952, he went to Afghanistan with Pandit Omkarnath Thakur and in 1955, he visited Britain and United States on the invitation of Museum Of Modern Art and OMNIBUS, the Rockefeller Ford Foundation TV Workshop in performances with Sarod Maestro, Usatd Ali Akbar Khan. In 1956-57, he toured to North America and Europe with one of the greatest sitar maestro Pandit Ravi Shankar and in 1960 he visited the Soviet Union and Mongolia with Indian delegations. In 1961, he went on a World tour with Mrs. Sharan Rani. His Second tour included the first ever fusion concert between the East & the West where Chatur Lal representing his Indian drums 'Tabla' and greatest drummer Sir Philly Joe Jones representing his Western drums. His last trip was in 1964 in association with Max Muller Bhawan, he organized a concert for his younger brother , Pt. Ram Narayan to West Germany which included 25 cities. Dr. Heimo Rau commented, "In India and Germany will never forget him since for them he opened that gate to the Indian music." This trip also took two brothers to France and Britain. Commenting on the performances of Chatur lal, The famous German Newspaper, Frankfurter Rundschan, said "Our little drums are stuck with sticks. 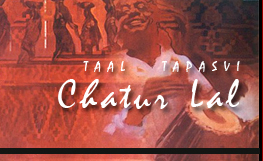 However virtuoso they may be, yet compared to the art of the Indian Tabla player, Chatur lal they sound barbarian. His playing sometimes sound like rhythmically arranged drops of rain, sometimes the finger flew over the membranes like a family of salamanders." Chatur lal developed a style of his own, noted for a lightning rhythmic pattern and an intimate understanding of the mood of the artiste he accompanied "his style", Mr. Lothar Lutze of Max Muller Bhawan said, "amalgamated" many different elements, among them south Indians ones, and with the artiste on his standing, became a personality  bound pure style. He always showed an uncanny adroitness and skill in his accompaniment, while his solo was notable for case, clarity, diversity and grace where that were all his own. On the occasion of the Paluskar Musical Festival in Delhi in 1960, the music critic of the Statesman aptly commented on the style of the great percussionist "After the interval Chatur lal gave a fine Tabla recital." Playing with great skills and finesse and weaving his percussion sonorities into every conceivable caprice of form of rhythm, he gave proof of his supreme command of the instrument. With perfect coordination between the two hands, the artiste played with tremendous zest and fervor passing at times into a mood of rhythmical abandon. It was a most impressive recital  forceful, fluent and almost unbelievably elemental in its rhythmic appeal. The "Drums of India" and "Drums On Fire" are some of the important solo recordings of Pandit Chatur Lal in Hollywood's 'World Pacific Recordings'. He also composed and gave music for a short animated Canadian film 'A Chairy Tale', 'A Certain View', 'Now what my Little Man'. A French Television also made a short documentary film on him "Rythmes d'aillenres".